► What is Selenium 2.0? Selenium 2.0 is a tool that makes the development of automated tests for web sites and web applications easier. It represents the merger of the original Selenium project with the WebDriver project. WebDriver contributes its object-oriented API for Document Object Model (DOM) interaction and browser control as well as its various browser driver implementations. Selenium 2.0 currently supports writing cross-browser tests in Java (and other languages on the JVM including Groovy), Python, Ruby, and C#. It currently allows developers to target Firefox, Internet Explorer, and Chrome with automated tests. It also can be used with HtmlUnit for “headless” application testing. Furthermore, driver implementations exist for the iOS (iPhone/iPad), Android, and BlackBerry platforms. 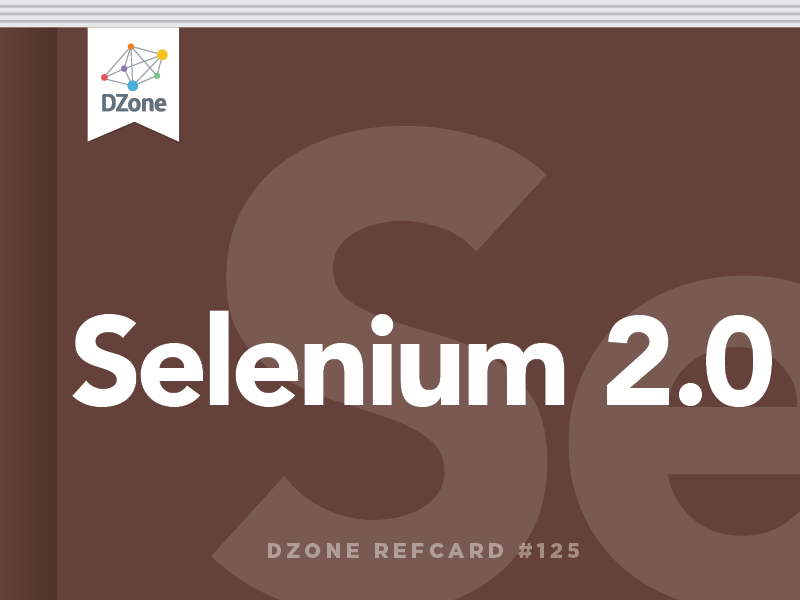 The remainder of this Refcard will focus on the WebDriver contributions to the Selenium 2.0 project and will take a brief look at how to leverage the Selenium API via WebDriver. The User: WebDriver drives the browser from your end user’s point of view. A “Best Fit” Language: each browser has a language that is most natural to use from an automation perspective. The various drivers are implemented as much as possible in that language. A Layered Design: developers should be able to write their tests in the supported language of their choice, and these tests should work with all driver implementations. Therefore, the developer API exists as a thin wrapper around the core of each driver. selenium-server-standalone-2.0a7.jar contains the Selenium server (required to use Selenium 1.x classes) and the RemoteWebDriver server, which can be executed via java -jar. selenium-java-2.0a7.zip contains the Java language bindings for Selenium 2.0. All of the necessary dependencies are bundled. Download selenium-dotnet-2.0a6.zip and add references to WebDriver.Common.dll and WebDriver.Firefox.dll (or your browser of choice) to your Visual Studio project. The Firefox driver is the most mature of the browser-based drivers. The Internet Explorer driver has been tested and is known to work on IE 6, 7, and 8 on W indows XP and Vista. Compared to the other drivers, it is relatively slow. You cannot visually inspect what’s going on during your test. It is possible to emulate Selenium Remote Control (RC) using the WebDriver Java implementation on any of its supported browsers. This allows you to maintain both WebDriver and Selenium test assets side by side and to engage in an incremental migration from Selenium to WebDriver. In addition, running the normal Selenium RC server is not required. On the downside, you may notice some inconsistencies in behavior since the entire Selenium API is not implemented (eg., keyPressNative is unsupported) and Selenium Core is emulated. You may also experience slower performance in some cases. In each case, findElement will return an instance of WebElement, which encapsulates all of the metadata for that DOM element and allows you to interact with it. If the element does not represent a select element, this constructor will throw an UnexpectedTagNameException. If you’re driving an actual browser such as Firefox, you also can access a fair amount of information about the rendered state of an element by casting it to RenderedWebElement. This is also how you can simulate mouse-hover events and perform drag-and-drop operations. The Page Object pattern is a useful tool for separating the orthogonal concerns of testing the logical functionality of an application from the mechanics of interacting with that functionality. The Page Object pattern acts as an API to an HTML page and describes to the test writer the “services” provided by that page, while at the same time not exposing the underlying implementation. The Page Object itself is the only entity that possesses deep knowledge of the HTML’s structure. //Check that we’re actually on the Google Home Page. These examples assume the behavior of the Google home page prior to the introduction of Google Instant. For them to work properly, create a custom FireFox profile turn instant off in that profile, and then run your tests using that profile by setting the system property “firefox.browser.profile” to the name of your custom profile. GoogleHomePage page = PageFactory.initElements(driver, GoogleHomePage. This version of initElements will instantiate the class. It works only when there is a one-argument constructor that accepts a WebDriver instance or when the default no-argument constructor is present. WebDriver makes every effort to use a browser’s native XPath capabilities wherever possible. For those browsers that do not have native XPath support, WebDriver provides its own implementation. If you’re not familiar with the behavior of the various engines, this can lead to surprising results. WebDriver provides excellent capabilities around driving browers located on remote machines. This allows the tests to run in one environment while simultaneously driving a browser in a completely different environment. In turn, running your tests in a continuous integration environment deployed on a Linux system while driving Internet Explorer on various flavors of Microsoft Windows is a straightforward proposition. The RemoteWebDriver consists of a client and server. The server is simply a Java Servlet running within the Jetty Servlet Container (but you can deploy it to your container of choice). This servlet interacts with the various browsers. The client is an instance of RemoteWebDriver, which communicates with the Server via a JSON-based wire protocol. The URL for the remote server instance. A Capabilities object, which specifies the target platform and/or browser. DesiredCapabilities provides static factory methods for the commonly used choices (e.g., DesiredCapabilities.firefox()). WebDriver is capable of running tests both in the platform emulators and the devices themselves. The driver implementations employ the same JSON-based wire protocol utilized by the RemoteWebDriver. The iPhone driver works via an iPhone application that implements the JSON-based wire protocol and then drives a UIWebView, which is a WebKit browser embeddable in iPhone applications. Install the iOS SDK from http://developer.apple.com/ios. Download the WebDriver source from http://code.google.com/p/webdriver/source/checkout. Set the build configuration’s active executable to iWebDriver. The Android driver works via an Android application that implements the JSON-based wire protocol and then drives an Android WebView, which is a WebKit browser embeddable in Android applications. Install the Android SDK from http://developer.android.com/sdk/index.html. Run ./android and install a target API (e.g. 2.2). Execute ./android create avd -n my_android -t 1 -c 100M to create a new Android Virtual Device targeting Android 2.2 with a 100M SD card. Do not create a custom hardware profile. Install the Android WebDriver Application: ./adb -e install -r android-server.apk. You can download this from: http://code.google.com/p/selenium/downloads/list.